LONDON (AP) — After four straight losses, West Ham finally collected its first Premier League points of the season on manager Manuel Pellegrini's 65th birthday. "I was worried about the game," Pellegrini said after Sunday's 3-1 victory at West Ham, "because I was absolutely convinced we must win." He can thank Andriy Yarmolenko for his two-goal present. The former Borussia Dortmund winger only scored three times in the Bundesliga last season. The Ukrainian netted twice in the opening 31 minutes of his first Premier League start. After Cenk Tosun conceded possession inside West Ham's half, the ball was quickly played over the top to release Marko Arnautovic, who squared for the unmarked Yarmolenko to complete the counterattack with an 11th-minute opener. Goalkeeper Jordan Pickford's poor clearance helped to gift West Ham a second goal 20 minutes later. Captain Mark Noble fed the ball to Yarmolenko, who cut in from the right and curled the ball into the far corner of the net. "Everybody did an unbelievable job today, even the midfielders were everywhere," Arnautovic said. "And then it's down to us to score goals and win games. Congrats to Yarmolenko for two goals and I hope he will score more." 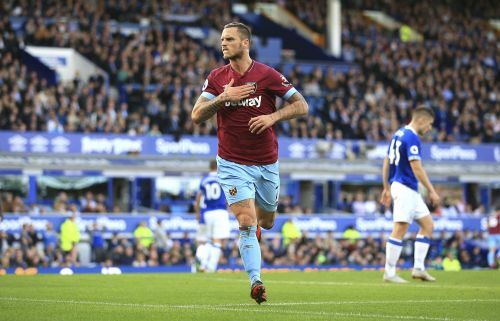 After substitute Gylfi Sigurdsson pulled one back before halftime, Arnautovic slid in West Ham's third in the 61st to complete the victory that eased the pressure on Pellegrini. "I see the players working every day and maybe in matches we haven't been able to perform like that but we must be able to repeat it during games, under pressure or with bad comments about our performances," Pellegrini, who won the title with Manchester City in 2014, told broadcaster Sky Sports. Everton has now lost for the first time under Marco Silva. Wayward finishing could prove costly for Wolverhampton. Although Wolves secured its second victory in five games on Sunday, when Raul Jimenez's strike sealed a 1-0 victory over Burnley, the score line didn't reflected the promoted side's dominance. "We should be more clinical," Wolves manager Nuno Espirito Santo said. "It is one of the things that we need to work on and improve. We are trying to improve and get better game by game. "We have another clean sheet, which is the most important aspect of the game for me, but the other part of the game is to produce and create. The players will work on the last touch and things will come." But Burnley is without a win in 11 matches in all competitions this season, after going through Europa League qualifying rounds and falling short. The northwest English club has lost its last four Premier League games and only collected one point so far.